Are you ready for a girl's night out unlike any other? Fresh off the best-selling book Girl, Wash Your Face, Rachel Hollis is taking the audience on an inside look at chasing the biggest of dreams with an inspirational one-night event! Come together with other women who don't look the same, vote the same or act the same and be inspired, supported and enveloped in community. 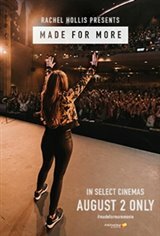 Believing you're enough, that you can chase the biggest dreams - they're all tackled in the documentary capturing the conquering of Rachel's own fears and trusting her gut. Get a peek inside and then have a Q&A with Rachel after the show. This is promised to be a night you and your girlfriends will never forget!